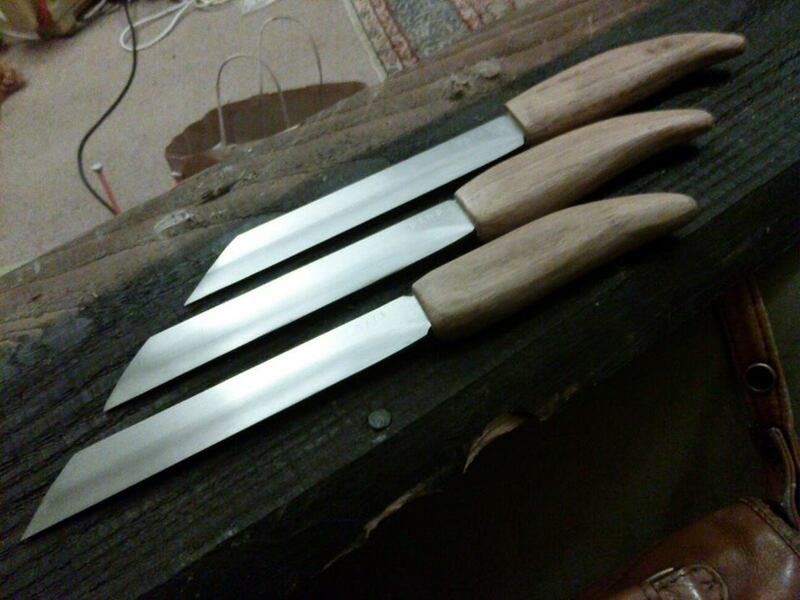 As I mostly make stock removal blades for HEMA fencers, its nice now and again to spend a few minutes hammering out a simple knife to stay in touch with the medieval blacksmiths whose work drives my day to day life. 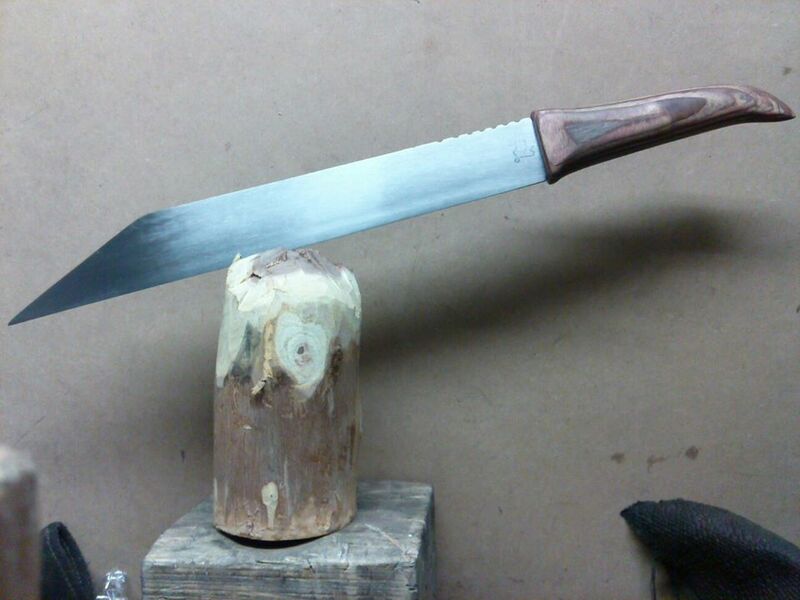 I grabbed an 8mm bar of EN8 mid carbon steel, heated it and quickly hammered out a really basic blade for a friend. It was especially quick as he wanted a really obvious hammered finish, so I made it as rough as possible. Its nice to see a rougher finish than the usual flawless sword gleam! 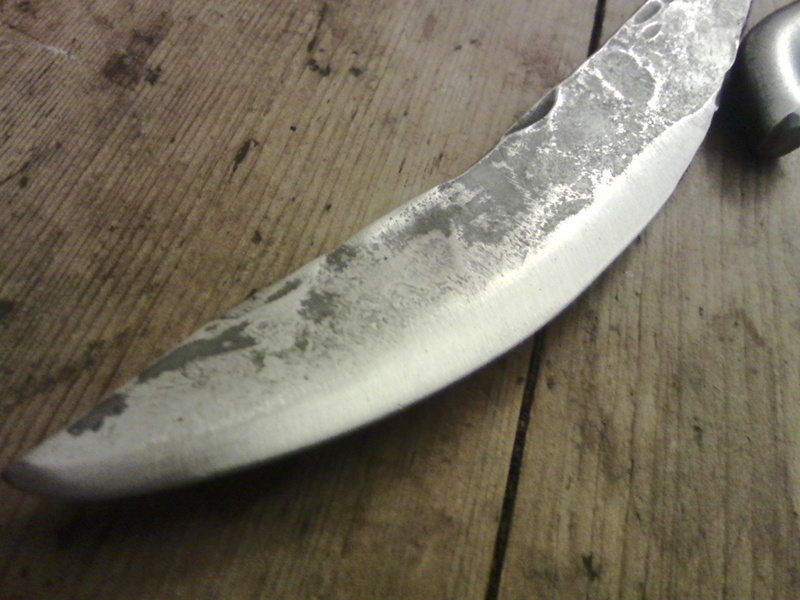 After I had the blade profiled I hammered a rough edge and hot bent the tang around to form the rudimentary grip. I heated the blade in the forge and quenched in oil, before tempering. And after that, grinding and whetstoning the edge only took a few moments followed by a rough sanding to bring out the hammerblows. I will definitely be doing more of these, there are a couple of old files just begging to be reborn! Working as an apprentice swordsmith, I have handled hundreds of swords, but there is one style of blade that has always delighted me: The Anglo-Saxon Seax. 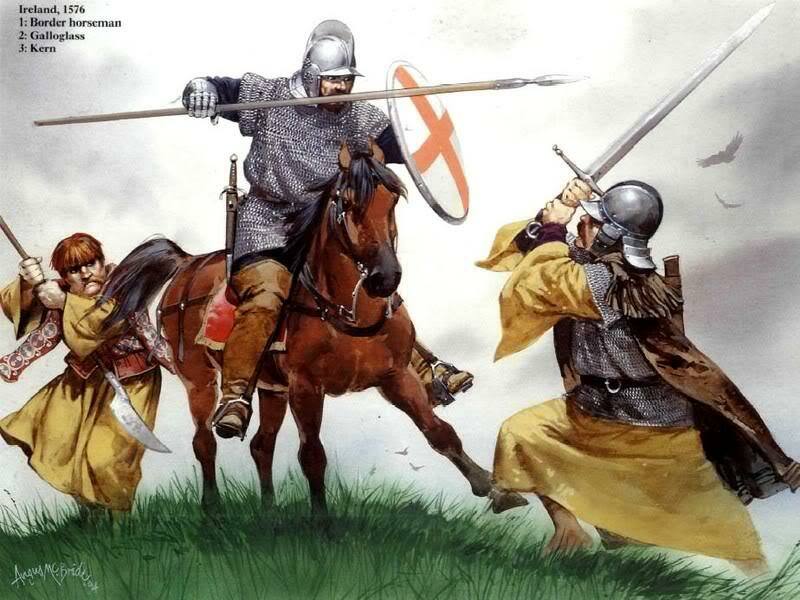 I adore its simplicity and the chunkiness of the blade, despite having far fewer opportunities for refined decoration than, say, a swept hilt rapier or a smallsword. 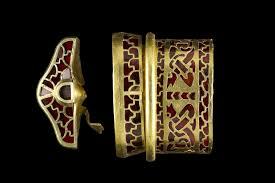 My final target will be to make a sword hilted seax in the style of the recent Staffordshire hilt discoveries currently on display in the British Museum. May take a few years though! 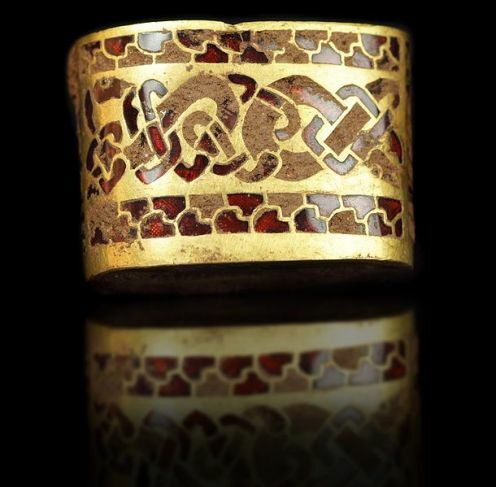 I will probably cast and carve brass in place of the original gold, and enamel the recesses rather than insetting garnets, but the effect should be very similar and it will leave me a further, far more complex and expensive, project for later. The seax at the top of the article is the first sword I made after getting my apprenticeship, I have also made a fair number of smaller ones as gifts to friends, I think pretty much everyone i know has got one now! 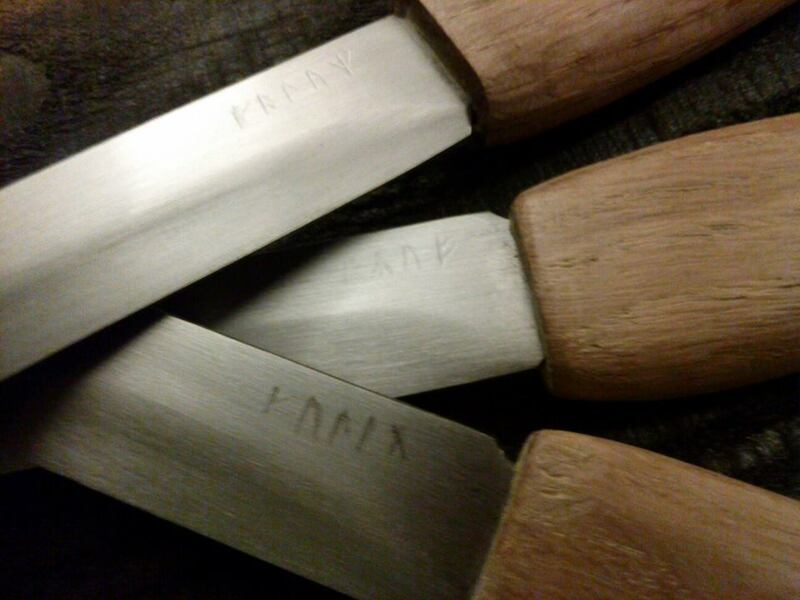 I always engrave a phonetic rendering of the recipient’s name onto the blade, mainly to make them a little more visually stimulating than just plain steel. I really need to pay more attention to my photography! 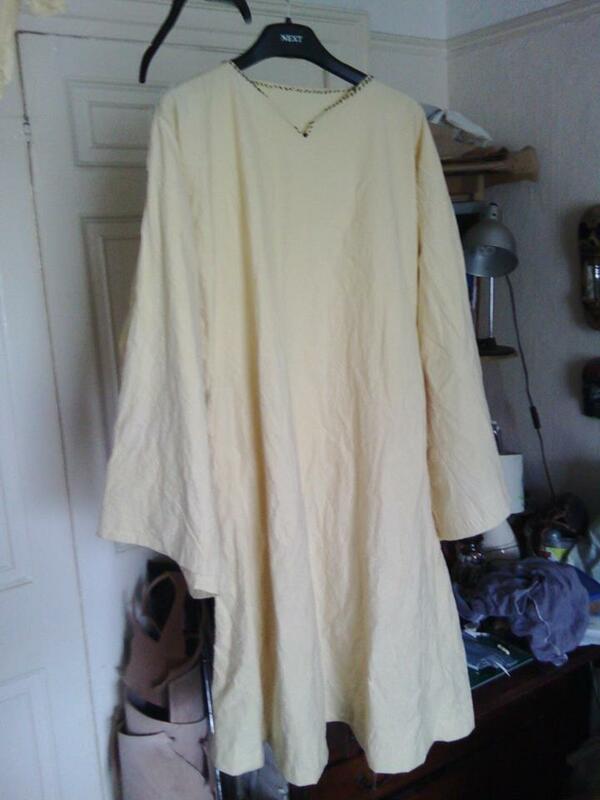 Several months ago I put together a Gallowglass costume to wear as an extra in a film. I only had a couple of weeks to put it together, and i wanted to make as much of it as possible. 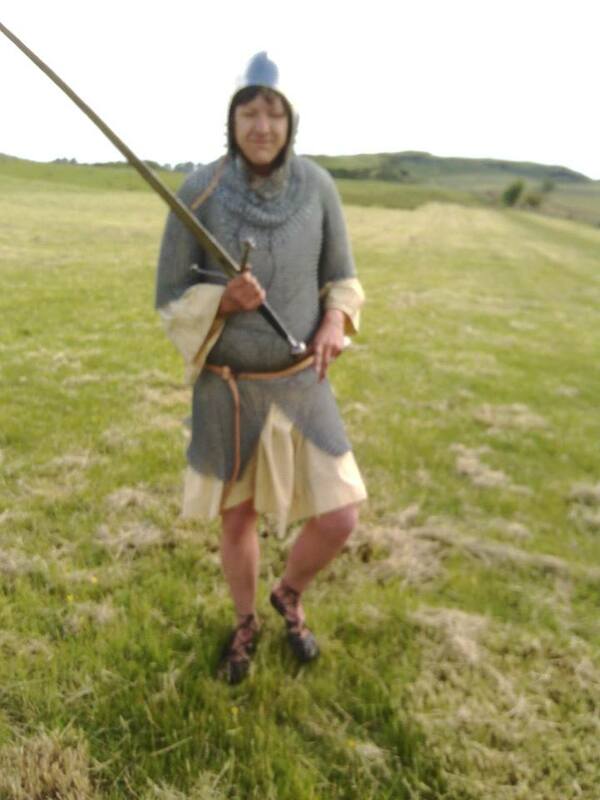 In the end I made a medieval robe or leine, a leather belt and pouch, about 1m^2 of chainmail and a sword. 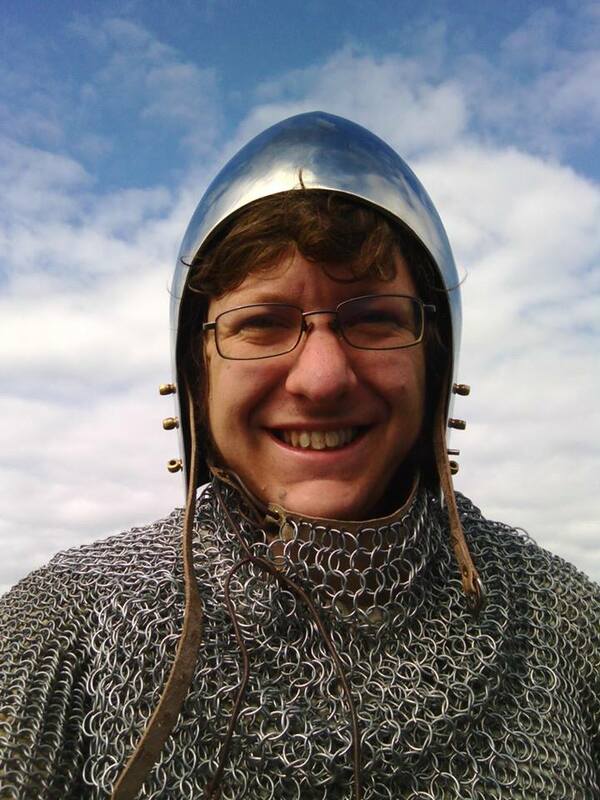 This wasn’t bad but I had hoped to finish the outfit off with a helmet and a full mail hauberk, plus a sgian knife. Sorry about the blurry picture, always a danger when you give your phone to someone else for a photo! According to the records of the time, the cloth was dyed with saffron to get a deep, almost orange colour. I decided to give it a go, with a little tea added to the mix to improve staining power. 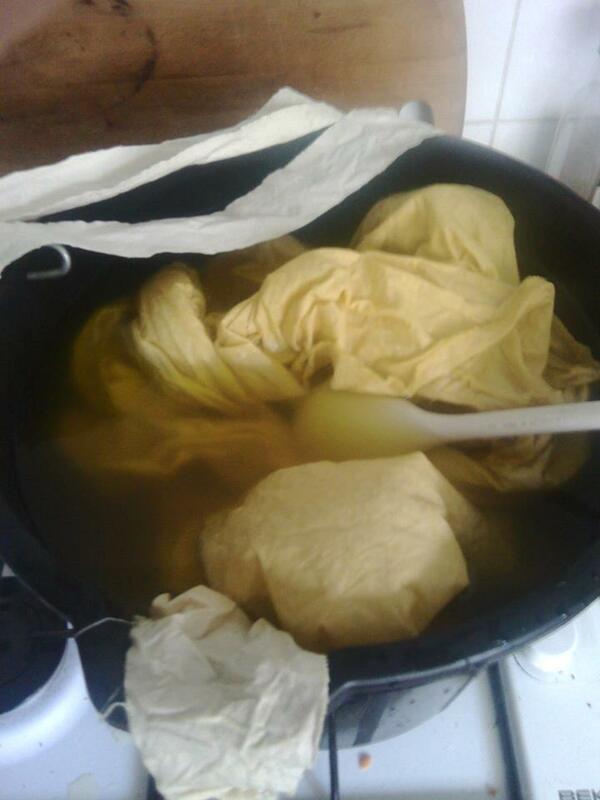 The strips draped over the sides of the bucket are undyed cloth, and demonstrate the colour difference quite well. In reality, I needed much more saffron to get a really good colour but I just couldn’t afford it! My friend who went up with me dyed his with dylon, and got very good result. We also reckon tumeric is worth a go. In the end, it got totally destroyed by the grease on the chainmail, which seeped around the edges of the aketon i was wearing underneath, but I redyed it a mottled green and I’m sure it will be pressed into service again at some point! There were some Irish reenactors in the camp with proper leines, which were pleated much like a kilt, but over the entirety of the cloth’s surface. Well worth a go at some point, padded defences like that are great to wear as they breathe and still provide quite a lot of protection. All in all it was a good weekend and I had a great time, as you can see from my grin!